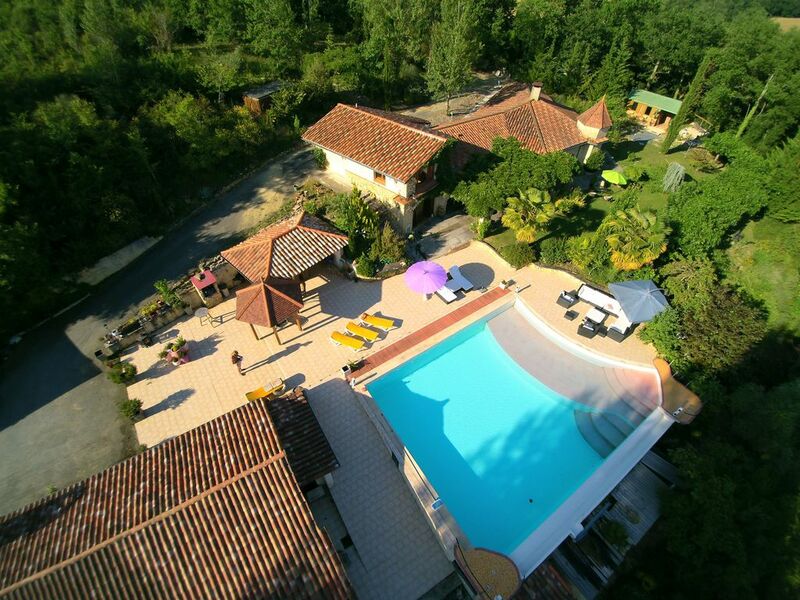 Your summer holiday rental destination is a complex of two villas and a small chalet, which combined accomodate up to 14 guests, located in Gascogne, a beautiful area of France. In spring you have a magnificent view of the Pyrenees. The large (11x12 m) endless pool will give you great enjoyment during our warm and sunny summers. The pool has its own large terrace, with 8 quality deckchairs. Large parasols will give you the choice of shade or sun. Both villas are well furnished with each their individual characteristics. Each villa has their own well located terrace to enjoy your lazy breakfast in the sun or the shade, provided by lovely trees around the villas. The patio at the main villa is the place where to meet for morning coffee. It makes for a diffiult choice, where to enjoy your glass of wine or have the afternoon barbecue. The villas are surrounded by your own private park on the gentle south slope, overlooking the Jazz village of Marciac. Rental rates are for the entire complex combined, so privacy is guaranteed! Marciac: The town of Marciac is worldwide known for it's annual Jazz Festival, which has drawn Jazz musicians from all over the world to perform here alongside well known names. When there is no Jazz, Marciac is the culinary centre of the Gers region; known for 'Foie Gras' and Armagnac. The vines of the Madiran and St. Mont wines are neighbours to your holiday property. Only 10 minutes walking from your holiday villas, you will find lovely lake Marciac with walking, dining and watersport facilities.Another 5 minutes more and you are in Marciac centre with its beautiful arcaded walkways, local shops, cafes and restaurants. At 10 minutes drive you will find the superb 18 holes Golf course Chateau Pallanne and horse riding is at 15 minutes driving ! Both places have a restaurant. It might be interesting for you to know that you have the possibility to take private lessons in the French language. Your teacher will come to your holiday villa for the lessons. availability of the property: The two villas of 'Le Vert Coteau' will be rented out together, but are also available for individual use. If this should interest you, please contact the owner directly for availability and rates. Keep in mind however that in this case there might be a family that uses the other villa and also has access to our large pool. A great opportunity to meet new friends. Also in case you are interested in renting the property during the winter or for longer periods it is advisable to contact the owner directly for special rates. Check with the owner for last minute rates/availability. Villas are constructed to be wheelchair friendly, with in the main villa one of the bathrooms specially made to accomodate wheelchairs or elderly guests. We found there seems to be a real demand for such a feature. The Gers is situated in the heart of Gascony and is also known as the Tuscany of France. The region is one of the most lightly populated areas of France with the purest airquality in Europe. It is delightfully free of traffic, mass tourism, and unspoiled by development. Far away from the stress and strain of modern living, the Gers is a wonderful place to relax, unwind and enjoy a slower pace of life. The Gersois actualy have the longest lifeexpectation in Europe! You will find youself surrounded by beautiful undulating landscapes of vibrant sunflower fields, gentle slopes of vines and quaint historical hilltop villages. The climat in the Gers enjoys long hot summers and short winters that are seldom cold. It has an amazing light, wether a hot sunny afternoon, or a crisp autumnal morning, there is a beautiful warm glow that bathes the land. The architecture and culture of the Gers is as rich and interesting as its history. There is the beautiful château of Lavardens, the historic abbey of Flaran and the fortified village of Larresingle and Fourcès, all within a short distance of one another ... these are only a few examples of the many places in this area to explore. The Gers cannot just be lightly touched, it must be lived. Whether you live it through the traditional, local markets in the main towns of Condom, Lectoure, Auch or through the fabulous gastronomic delights on offer in local restaurants, hotels and Chateaux – life here is most definitely good ! If you are looking for an easy pace of life, surrounded by stunning countryside and great climate, the Gers is definitely the place for you. Location: The location of 'Le Vert Coteau' is absolutely ideal. we are in the center of the Gers. Within one hour you can reach Lourdes at the foothills of the Pyrenees. Also beautiful Pau and Toulouse are within easy reach. It might well be the starting point in your search for your own property in the 'Gers' region. Several of our guests have already done so, and found their own dreamhouse. (References available on request) culture of the GYou could walk to the center of Marciac in a comfortabel 15 minutes. Working for one of Europes biggest Tourist organisations and tour operators, we think we have a fair idea about what our guests desire for their well earned vacation when they decide to come to us. Fell in love with it when we first saw it in 1999. In the worst time of the year, January. If you like a new property in winter without the beauties of the summer foliage and the warmth of the Southern French summer, it must be good. And it was..... We feel totaly at home there, in winter with the big fireplace as well as the summer with out outdoor kitchen and gorgeous pool. We originaly were looking for something closer to the coast, but this place proved to be so much better. The space, the feeling of safety, you don't feel anymore in the big tourist centers. The friendlyness of the local population and the peace and quiet we find here in our hectic lifes. Why are we renting out our place? Well. due to our work in tourism, we are occupied when others have their holidays. It was a pity to let the place and the pool go unused during our beautiful summers. This is why our guests benefit from this beautiful villa in Gascony. When you sit in our cool livingroom in summer with the arched windowdoors wide open and see the Pyrenees in the background. Or have your afternoon tea in the outdoor cuisine close to the pool. Two images that make me feel totally at home. The newly constructed patio with fireplace is great to enjoy at night, or for a comfortable breakfast with the family. The outdoor kitchen is perfect for an afternoon barbecue and offers plenty seats for all of you to enjoy dinner there. We added a small fitnessroom with large windows. You might not want to think about fitness during your vacation. But if you need it, it's there....... The small chalet we recently added is great to accomodate 2 even 4 of our younger guests. a bit more privacy and even your own terrace if you want some peace and quiet. The terrace is build in such a way, it gives the impression of a treehut. The main villa has a separate bathroom fully equiped for the use by elderly, or guests depending on wheelchair. Shower with seat, elevated toilet with armsupport and washbasin. The entire villa is wheelchair friendly. Also the area around the villas are easily accesible for everybody. In case you need more information, we can supply you with references of guests who stayed at our place with wheelchair depending family members. Internet available in as well as around the main villa. Including the garden kitchen and the chalet. Included in rental rate. No need to worry about kitchen space. The main villa has a very well equiped kitchen, including build in 'steam oven' furthermore, the second villa has a kitchen and there is the garden kitchen. Private balcony with the second villa and private balcony with the chalet. Both are wonderful for a good book on your own. Bicycle rental available in the village of Marciac. Chateau Pallane has on of the most beautiful 18 hole golf courses, just 10 minutes away from your villa. We have installed a new separate bathroom which is fully wheelchair accessible, with toilet washbasin and shower equiped for the needs of our guests with limited abilities, or the elderly. (see our last reviews) The entire area around the villa are wheelchair friendly. The villas are large and airy and smoking will not affect the atmosphere inside. I am personally allergic for smoking, but I never seem to have any problems when I am home. Over the years we are renting out our villas, we have very well listened to your suggestions, and added and changed several things to make your vacation at our place more enjoyable. Latest addition is a small chalet, (sleeps 4/5) and would be great for the kids. They have their privacy and will enjoy the surroundings. We also added a fitness room for our guests. This fitness room is not yet fully equiped, but all the basics are there. Our stay in Marciac was fantastic ! We stayed in this villa with 11 adults and one 4 year old boy. We were very suprised when we arrived at the location. The pool is magnificent and the houses are fully equiped with everything we needed. The guidance and advise we had from Jean-Paul was very valueable to enjoy our stay in marciac and the other surrounding towns. We also enjoyed the 'high-tech' kitchen in the main villa. It was a pleasure to cook our holiday meals here!. We will be coming back next year! The best equipped kitchen we ever had in a vacation villa (state-of-the-art electric devises). Very big pool with a beautiful view. Welcome package with food on arrival proves very helpful (especially if you arrive on a Sunday afternoon). Very nice personal welcome from local agent. Villa was very clean upon arrival. Extra-spacious living room with state-of-the-art flat-sreen TV. Beautiful garden and terrasses with good equipment. Very quiete. Well-working PC with internet access for guests. Small "negatives": second sleeping room has no windows and is only suitable for small children. Therefore, we found that although the villa is very spacious it is not suitable for more than 3 adults. The loom has neither windows nor ventilation. All in all: we consider to come back in one of the next years. One of the best vacation villas we have rented so far (perfect for 2 adults who appreciate some extra space). Marciac is located in the 'Gers', also known as Gascony, bordering with the 'Hautes Pyrenees' about one hour from Lourdes and the Pyrenees. Marciac, a typical 'bastide' village, is well known for it famous August Jazz festival. The lovely rolling hills are a perfect backdrop for trips to the numerous beautiful castles just a short ride away. Summer here is warm and sunny, but also spring and autumn have comfortable warm temperatures. Come and see for yourself. If wine is your thing, check out the famous 'Madiran' wines (Chateau Montus) or the the St Mont wines, of which the vines grow next to our property. If you ask any French person about the Gers, generaly the reaction will be: 'on mange bien la bas' (you eat well there). Well, if even the French will tell you that you eat well in the Gers, maybe you should come and try it out. It's worth it! Golf: Within 10 minutes you find the beautiful 'Château de Pallanne'. The 18 hole golf course is located around a splendid 18th century château in a gorgeous setting. There are several other golf courses within one hour drive from Marciac. You will find that also for a golf vacation with friends, our villas are a perfect starting point.